Flying the CRJ1000 was one of my priorities for this trip. Its a new plane - a rare type not just in Asia, in other parts as well. At this point of time, there were less than 50 flying. 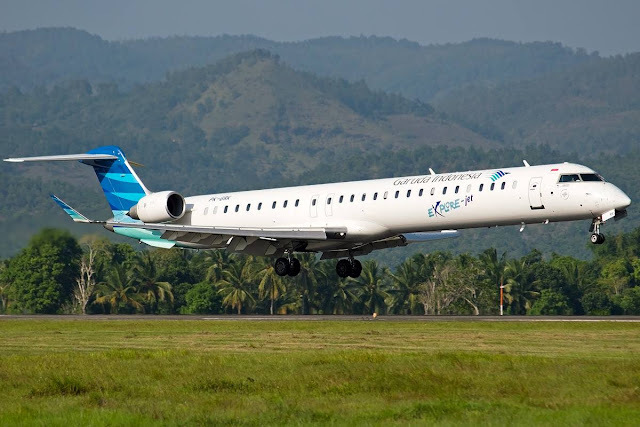 Garuda was probably the biggest operator of this type with 12 operating for the airline. I just hope that I would get on one and not get a last minute equipment changed to something else (probably Boeing 737-800). I have been on the CRJ-1000 once but at the Singapore Air Show in 2012. The airline that operated this beauty was Brit Air and was lucky enough to board the aircraft to have a feel. My first impression was how long the aircraft was, however I found it to be quite cramp compared to the ERJ190. Didn't get to fly the last time, but this time I did even though it was a short 40 minutes flight. Garuda's website is managed by Amadeus. Website is pretty much basic but it does what it supposed to do. No problems with the booking. I purchased my ticket for this flight for around S$50, a bargain if you ask me! Do check the flights before you book. Not all Denpasar-Surabaya flights are operated by CRJ1000. My flight was GA341, a 10.25 departure from DPS to SUB. The funny part was I was arriving at SUB at 10.25 (1 hour difference). Bali International departure terminal was opened, I took some few photos while I had a bit of time. At that time, it was not completely opened. I checked out the sections of the airport before heading off to the Garuda's check-in counter. Do take note that flying with Garuda, you do not need to pay airport tax as its already included in the air ticket. I wonder when will that be included to other airlines. If you are flying on other airlines, do remember to leave some money for the tax. 150000 Rupiah for a person for international flights and 40000 Rupiah for domestic flights. I feel like going for a chalet or a holiday resort, looks nothing like an airport. Do take note that a lot of locals will ask you to take their taxi, avoid them and go to the taxi counter located just outside the arrival hall. The new section of the airport. I made my way to the check-in counter. Looks very odd in this surrounding, in fact very cheap-skating looking. I was wondering at one point, was I in a budget terminal? Even Singapore's Budget terminal (Now defunct) looks better than this. Anyway, I checked in confirming my seat, 37A. Only to find that I got 29A which was not what I want. Only realized this when I was at the gate waiting. I believe out of courtesy, the counter staff should have told me about the seat change but that doesn't matter. Later on, on the aircraft it turned out be an almost empty plane, I got to choose where to seat just before the aircraft pushed back. I was assigned to 29A with another passenger beside me, but he moved then only I moved to the rear. More of that in my later part of the report. Checking out the the domestic departure hall. The holding area consists of 2 gates, most of the folks were on another Garuda flight to Jakarta, GA405 on the same aircraft that I flew on; PK-GPJ. At this point, I was feeling very excited! I was definitely going to fly the CRJ1000 and now we need to take the bus to our aircraft. The old way of boarding the aircraft, but one that I always enjoy! The airline had added the 'Explore Jet' titles on this beauty. The bus took us past many aircraft and then a sight of the CRJ1000 appeared. A huge smile broke through my face and before I knew it, the bus stopped in front of the aircraft! I felt like a new kid playing with his new toy. Boarding begun with my camera on one hand! Enjoy the photos! Very comfortable leather seats with good legroom space. I was seated at 29A with another passenger. I wanted to move but waited for more passengers to board first. Once I noticed boarding had ended and the passenger besides me moved to another seat, I asked the crew whether I could move a few rows behind. "Yes, Sir. You may move behind. The rows behind are all empty, feel free to pick one." I chose my original row - 37A. This is the view you get if you sit at this row! The seat I was supposed to sit (29A) offered this view. Settled down nicely at 37A, the crew had no problems with me taking cabin photos! They knew at once that I was an aviation enthusiast, as they had encountered quite a number not too long ago! Feels like I am on a private jet! Very nice cabin interior. As you can see how low the ceiling is. Flight attendant sits at that last seat in between the toilet and the small gallery. Sorry for the blur shot. See how small this toilet is, I had a hard time inside it. Thanks to the wonderful crew, I also had a picture taken! I had thoroughly enjoyed my flight so far! The rest of the passengers didn't really care what I was up to and even this crew also leaving me to take whatever photos I wanted. He even went to the front cabin for a short while just to let me take some photos. Thank you to him! I like this new version of GA's safety card, looks much nicer than the previous version. I was pleasantly surprised to receive a snack box for such a short flight! A cake and a hotdog with a small packet of drink. Some other airlines should take a look at this! I had nothing but praises for this airline so far on this trip. The airline had certainly made lots of improvement for the past few years and it deserved to be joining the Skyteam alliance on the 5th March. There were 2 crew on board this flight if I am not wrong. One was serving the front cabin and the other at the rear. The load of this flight was low so it was easy for the one at the rear to manage. Even though it was just 2 of them, but they were pretty nice and so were the flight crew whom I got to meet after the flight. More of them later in my trip report. Some window shot photos! It was a prefect day for flying! Smooth weather all the way, can't ask for more. This photo was taken at the last window seat, you won't get obstructed by the engine when you fly on the CRJ1000. Flying in good weather makes it very enjoyable! The old 737-400 was spotted over here, had not seen this plane for quite a while! Its been retired. Parking at Surabaya's terminal 2 but at the remote bay which means I got to get off the plane from the stairs. But before I got off, I managed to visit the cockpit to take some photos and had a brief chat with the Spanish Captain and the first officer from Alaska. A big thank you for these photos! This aircraft is real powerful when it took off, the cabin noise was quite quiet and it would be even more when sitting in the front of the aircraft. The only setback of the aircraft is the cabin is too small for my liking. Comparing this to the ERJ190, I would say I prefer this better in terms of comfort and spacious. The toilet itself, you have to squeeze inside to be able to use it. But in terms of flying, this plane flew beautifully. Engines may look small from the outside, but when I had gotten my first take-off of a CRJ jet (any series), I was deeply impressed. I would highly recommend anyone to give this a jet a try. Currently, it isn't flying on regional routes, but perhaps in the near future it will. 12 of this type currently and its not that difficult to find a route that is flying this aircraft. The money spent on this flight is definitely worth every cent of it! Every single minute of the flight was enjoyable, partly because the flight was empty and the crew were great. Its a different experience from what I had gotten after my first experience with this airline a couple of years back. Back then I flew on GA's 737-800 to CGK and didn't exactly had a positive experience and I paid about S$165 for a one way ticket and that was expensive. 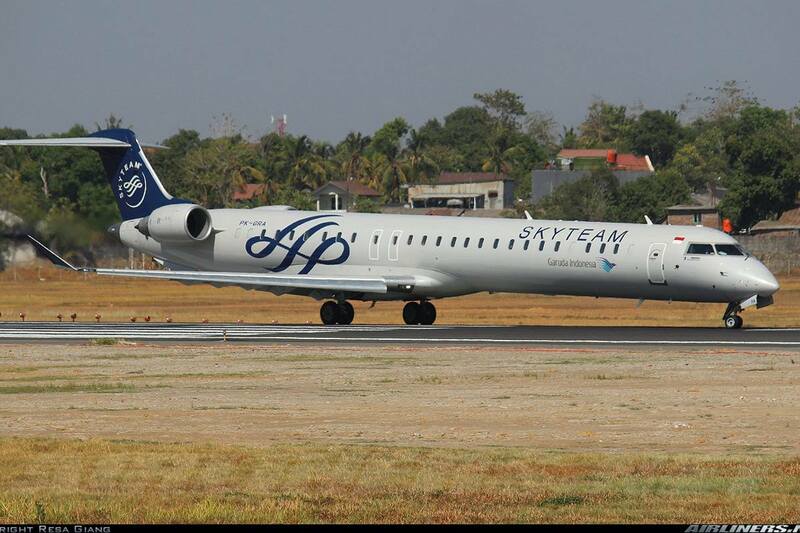 I would certainly recommend everyone to give this aircraft type and of course the airline a try. Do check out for offers by this airline, some of the prices are even cheaper than the Low Cost Carriers over here. Now I need to try the other CRJ types to gain more flying experience (as a passenger) to my flight logbook. I would say among all my flights, this has to be the most enjoyable one so far. I hope you enjoyed my report, do stay tuned for my next one! You think the DPS Domestic terminal was bad then. I went though when there was no carpet or decent seating. Not many shops open. When I went through, the floor was bare cement. Queues were horrific, cockroaches everywhere! -- To top it all off, we got delayed for about 5 hours!!!!!! To be honest, the standard in Indonesia airports is appalling especially the old buildings. Not only that - fllight delays, dirty toilets, shortage of shops can be a traveller's' nightmare so I understand how you feel. I am from MAKE Productions, and we are interested to use a couple of photos in your blog posts for a documentary on Garuda. Would you let me know how I can PM you to provide you with more details on the documentary and seek your permission on the use of the photos, please? Thank you.